Meeting the needs of a government contract takes additional skills and planning. When the Architect of the Capitol, Carolina Door, and U.S. Bulletproofing Company needed custom extrusions to meet historical preservation and security requirements; they called on Mac Metals. Learn more about our work for the US Capitol Building below. 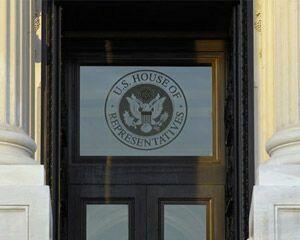 Carolina Door and U S Bulletproofing utilized two brass extrusions to fabricate new doors for both the House and Senate entrances to the U.S. Capitol Building. These doors had to meet the historical renovation criteria as well as meet bullet-proof/ blast-proof requirements for government buildings. Bronze finish is oil rubbed. Mac Metals provided custom extrusions K31394 and K31395 to meet the needs of Carolina Door Controls and US Bulletproofing. Images below. As part of the renovation, Mac Metals was contracted to meet the needs of 3 separate entities: The Architect of the Capitol, DORMA Incorporated (Formerly Carolina Door Controls), and U.S. Bulletproofing. The Architect of the Capitol (AOC) is the builder and steward of America’s Capitol, serving Congress and the Supreme Court, creating a home for American democracy. The AOC traces its beginnings to 1791. Today, the AOC is comprised of approximately 2,300 employees who serve Congress and the Supreme Court in a variety of occupations. Read more about the Architect of the Capitol and the projects here. Acquired by DORMA in 2005, Carolina Door Controls engages in selling, installing, and servicing automatic doors for commercial applications in the United States. DORMA-Carolina Door Controls, Inc. was formerly known as Carolina Door Closer Service, Inc. The company was founded in 1966 and is based in Durham, North Carolina. DORMA-Carolina Door Controls, Inc. operates as a subsidiary of DORMA Group North America, Inc.
United States Bullet Proofing, Inc. offers one of the largest product lines of Blast, Ballistic and Forced Entry Resistant Doors, Windows and Wall Systems. Uses include buildings, safe rooms and guard booths. Our unique product designs have been developed to compliment today’s architectural doors and windows. Mac Metals is a “specialty brass mill” that provides custom architectural metals to architects, general contractors, original equipment manufacturers, machine shops and architectural and ornamental metal fabricators that require custom extrusions made of brass, bronze and nickel silver. For the Full Project, please click here, or download the US Capitol Door Renovation PDF.